Advocates for Literacy has released a statement regarding the Administration’s continued attempts to eliminate the Comprehensive Literacy Development Grants to states, currently funded at $190 million per year. RRCNA is a founding member of the coalition, and we will continue to advocate for increased federal funding for literacy instruction as the House and Senate track through the FY 2020 budget and appropriations process. “Advocates for Literacy, a coalition of over 60 organizations focused on increasing the federal commitment to improve literacy instruction through evidenced-based practices, strongly opposes the elimination of the $190 million Literacy for All, Results for the Nation (LEARN) program—referred to as Comprehensive Literacy Development Grants—in the President’s Fiscal Year 2020 budget proposal. The Advocates for Literacy coalition believes that literacy is a critical component of job readiness, and it is essential that all American students graduate with the literacy skills they need to be successful in the workplace. A strong federal commitment to literacy is imperative. The Coalition believes the Administration’s budget missed an important opportunity to support students and the economy. The Elementary and Secondary Education Act (ESEA) was established to ensure that all students have equitable access to a quality education and to narrow achievement gaps; high-quality reading and writing instruction are foundational components of a quality education. LEARN supports states in a comprehensive, systemic approach to strengthen evidenced-based literacy and early literacy instruction for children from early learning through high school and supports district capacity to accelerate reading and writing achievement for all students. Additionally, LEARN is the only funding stream that helps states and districts support high-quality professional development for teachers, librarians, principals, specialized instructional support personnel, and other educators to improve literacy instruction for struggling readers and writers, including English learners and students with disabilities. RRCNA continues to encourage U.S. Reading Recovery leadership to take an assertive role in ongoing outreach activities as states develop and implement new education plans. 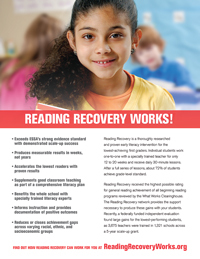 Many resources are available that document the effectiveness of Reading Recovery—already determined to meet the strong evidence standards of ESSA—and the benefits of Reading Recovery training and ongoing professional development to comprehensive literacy efforts. In addition, any citizen can make a call to the U.S. Capitol operator at 202-224-3121 and be transferred to the office of your senators or U.S. representative.